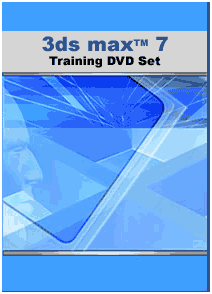 Our instructor led video based 3D Studio Max 7 Training course on DVD consists of over 11 hours of training and tutorials. This interactive training program covers everything you need to know to start using all of 3ds Max's tools. Lessons are organized starting with simple concepts, and proceed on to the more advanced. We cover all the main features of 3DS Max, including the interface, modeling, modifiers, materials, maps, lights, cameras, animation, rendering and much much more. Each part is talked about in depth with many tutorials included for the interaction with the user. This training course also explains the many new features of version 7. Whether you are new to 3D Studio Max or have basic knowledge of the program, this training product is the perfect choice for you.